The idea of building a partially destroyed marble themed base was one I wasn't sure would work when I started. 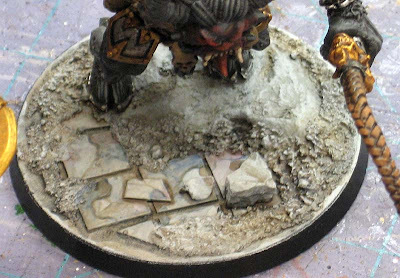 After seeing someone else paint up marble on one of their bases, I wanted to try something similar on mine as well. 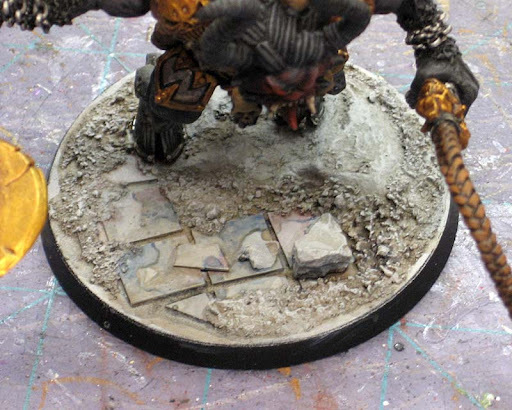 And it's tough to get a Khorne basing tutorial done in only 8 pictures. With that out of the way, let's look at what I did. Building them (the bases) was done in steps. I had to add the tiles (plasticard) and mound of dirt (sculpting clay) before adding the model since he was pinned to the base. Only after I painted the whole model, did I go back and sand the base and add a few more marble chips (plaster). Then I started painting the bases. This is what I was starting with. 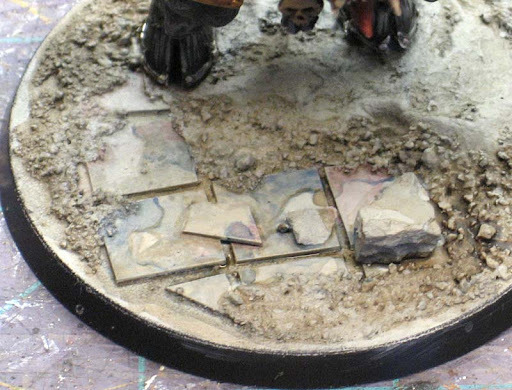 A finished model and the base with all it's elements there. Priming and basecoating in one step. 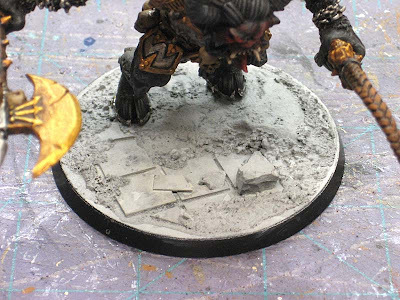 The base is primed the same color as the model, light grey. You need to make sure you have a good, consistent coat before going any further. And, it needs to be completely dry before moving on. With all the steps in this process, it's critical that you let the previous step dry completely before moving forward. Trying to rush this process will only ruin the end result. The first wash. Starting with Badab Black, you thin it down to where there's almost no color in it and apply it to the recessed areas of the base. The cracks in the rocks, some patchy areas of the sand and around the Bloodthirster's hooves. The second wash. 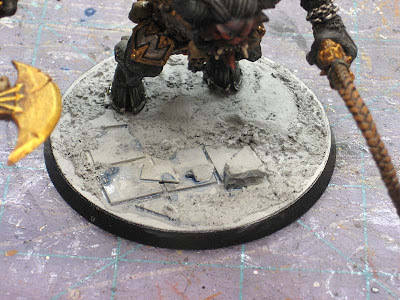 Using Asurmen Blue this time, you thin it out to where there is next to no color and then go in and apply it to the tiled area of the base. You don't want complete coverage, instead you're going for something splotchy and haphazard looking. Third and fourth washes. Just like the blue in the previous step, you do the same thing with Baal Red and Devlan Mud. You can overlap in places, you can keep the colors seperate, you're realy going for something that has no patterns and looks "right." Now for the lines in the marble. You can go back and follow some of the more distinct color edges or you can make your own lines, both work and I do a little of each. You can use the Blue, Red or Mud color to do this and you just keep making passes over the same lines to darken them to the point where you like them and they stand out a bit. Drybrush the highlights. I use the same light grey I primed/based him with. The addition of all the washes will have darkened the overall piece slightly and you can get away with using the same original color to add some subtle highlights. Since there is so much texture on the base, I just do a quick drybrush. This may cover up some of your work if you get close to the tiles but you don't have to worry, it shouldn't be anything noticeable in the end. Last step. Using Badab black, Devlan Mud and Gryphonne Sepia, go back and reinforce the shadows, darken the marble lines if needed and add some variety to the sanded areas. You don't mix all the colors at once but use them individually in key areas to help finish off the base. 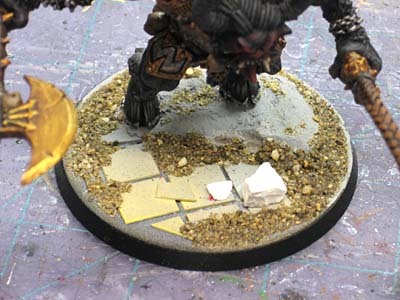 In this case, I used the black in the sanded areas and around the chips to add depth, the Mud in between the tiles to make them stand out and picked a few spots to add the Sepia for variety and a little warmth to tie the base in with the model. That's a great effect! Thanks for sharing. Interesting technique. TBH, I'm not sure I like it. Sometimes pics look different than the "live" model, but the haphazard look of the washes seems a bit off. Sorta like you were eating a snowcone over the model and got a few drips. Nice effect on the tiles, reminds me of the water damaged tiles in the bathrooms of an old school my family bought. I couldn't disagree more with that snowcone comment. I have used real marble before, and that is near exactly what it looks like. Thanks guys. I'm getting better at it (creating the marble effect). I think the scale and learning how and what to add or leave out is important. I need to be able to get a close enough representation that people make the assumption that it's marble... even if it's not 100 percent accurate. 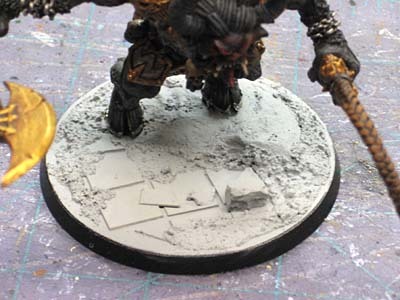 Just wanted to let you know I used this tutorial on a base for a Skulltaker. Really great effect, and not too hard to pull off after reading this. Thanks! Excellent, send me a pic of the results so I can see how it turned out! Finally finished the blog post about it. Just realized you can't see much of the actual tile work as most of it is below Skulltaker's cape and my pictures don't capture it well. It was a gift, now given, so I'll take the camera with me next game and see if I can get a good shot to send you. I got to hold Skulltaker yesterday. Given how the ol' daemon is standing, what I posted on my blog post is about the best I'm going to get. Take a look at the third (which shows the mounting holes) and the last photo. 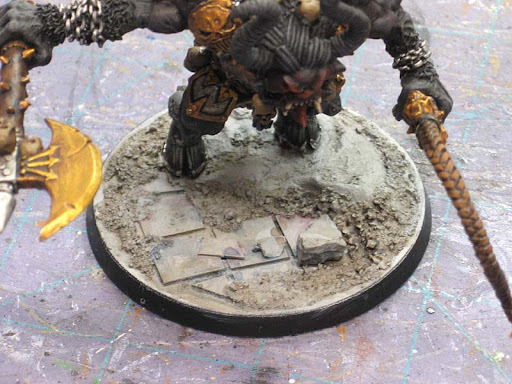 Only thing I added to the base between shots is a thinned Gryphonne Sepia wash. It did lessen the impact of not thining the other washes enough. Next time I try this, I'll make sure the figure isn't blocking the tile work. the other Kevin: Glad it could help.